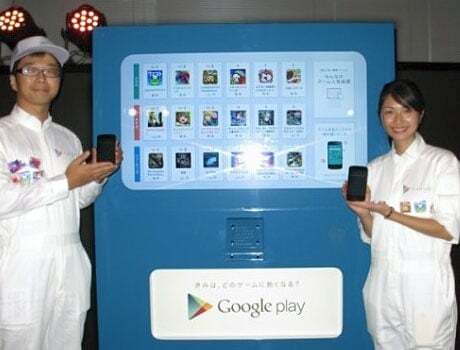 Google Japan has unveiled a vending machine that allows consumers to tap to download Android games from the Google Play store via NFC. The units will be located outside the Parco department store in Shibuya, Tokyo, for a short time, reports Engadget, and will offer a mix of 18 free-to-play and paid-for apps that can be obtained by placing an NFC phone on a tray located below the touchscreen. Potential buyers require a smartphone running Android 4.0 or later. Two on-site assistants are also available to help those without a compatible handset try out the service, using a Google Nexus 4 NFC phone.